Talented Gil Atencio (202-PF-96) had a very impressive game in the last round for Toros and that's him to receive a Interperformances Player of the Week award for round 15. The 22-year old power forward had a double-double of 27 points and twenty rebounds, while his team beat Atletico Nacional (#5, 5-10) 81-68. 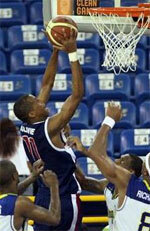 Toros maintains the 6th position in Panamanian LPB. The season is in a full swing, so it's only a dream for the team to make it into top half of the standings. For contrary they may face relegation if the situation turns from bad to worse. Toros have already lost 13 games and recorded just two victories. In the team's last game Atencio had a remarkable 90.0% from 2-point range. He turned to be Toros' top player in his first season with the team. St. Clair College graduate has very impressive stats this year. Atencio is in league's top in points (8th best: 14.8ppg), rebounds (9th best: 8.1rpg) and averages solid 1.9bpg and 54.0% FGP. The second most remarkable performance in last round's games was another Toros' star - 38-year old point guard Joel Munoz (183-PG-80). Munoz impressed basketball fans with a double-double of 15 points and 17 assists. Of course together with Atencio he helped Toros with another comfortable win 81-68 over slightly higher-ranked Atletico Nacional (#5, 5-10) being unquestionably team leader. Despite this victory they still are dead at the bottom. 13 lost games are too many comparing to just two victories Toros managed to get this year. Munoz is well-known by Toros fans and together with Gil Atencio they both established positions among team's most reliable players. The third best performed player last round was American Angel Matias (193-F-92) of Caballos (#3). Matias got into 30-points club by scoring exactly 30 points in the last round. He went also for five rebounds . 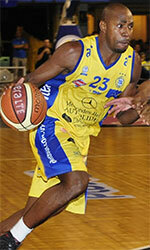 He was a key player of Caballos, leading his team to a 82-73 win against #4 ranked Panteras in a game of the week. Caballos needs these victories very badly if they think about getting closer to top teams. Their record at this point is 9 victories and 6 lost games. Matias has a great season in Panama. After only 9 games, he made it on the list of the league's leaders in points with 16.1ppg (5th best). He also has FGP: 53.1% and 3PT: 43.3%.